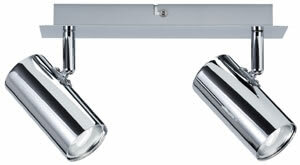 The 2-lamp -Zyli- spotlight combines energy-efficient technology with attractive design. The product includes a lamp, ESL aluminium reflector lamp 8В W GU10 polished chrome (88252), on delivery and is suitable for wall and ceiling mounting. The gently targeted diffusion of light ensures pleasant room illumination and enables you to set lighting accents.